The good thing about having US-based customers is that people in the call center industry who support them also enjoy a time off whenever there is an American holiday. So yesterday we did not waste the precious non-working day and spent it mall hopping. It was a day I never thought would bring back so much personal memories. Our first stop is the farthest among our itinerary and it is for a lunch we planned since last year–our ever favorite Japanese food dine out. The Dad’s buffet routine went like the ones we had in the past—get plate, pick food, eat, get another plate pick food, eat. But the golden kuhol did the least expected. As I remind my son that these are the same snails Jack of Oggy and the Cockroaches cooked, my mind opened up another stored story. It was sometime around the ‘90’s when I, with two other friends, had a scary experience because of our fondness for these golden snails. We were picking live kuhol from a rice field on a very sunny noon when all of a sudden we heard someone shout from afar. It was an old man who immediately sprinted towards us. Surprised, our adrenalin kicked in but despite our best effort to make a dash across makahiya-filled grounds, we got caught as others heed the call of the old man for help. My friend (the other escaped) and I soon learned—too late—that we have trespassed a private area which we have been frequenting to get the abundant kuhols in the rice paddies. Thankfully, the folks ruled out detaining us in the nearby police station—they must have realized that we are minors—and instead dropped us off at home before dinner time. Ulam was not kuhol, by the way. 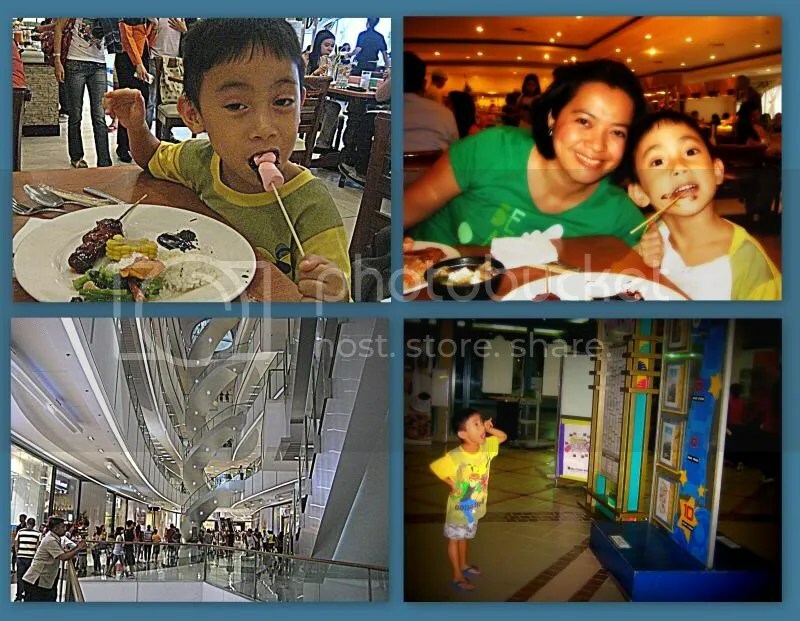 A couple of minutes after the crossover buffet lunch in Megamall, we headed to Rockwell in Makati to claim my 2011 SY yearbook in AGSB and also to give wifey and Marcus time to window shop in the Power Plant Mall. And like my other visits in this posh place, just being around–without even spending a buck except for parking–makes me thank heavens for giving me the opportunity and support to endure two years of MBA education. God must have a plan after all with the lessons and experiences he gave me from a lowly kuhol to a pricey MBA degree. Our supposedly last stop on our list is SM Aura. It is new, it is beautiful but I was not impressed. In spite of its extraordinary shape, a far cry from the boxy SM malls, I find its interior dark and its atrium area a bit tight compared with other malls. Well, since it opened only last May 17, I would expect that they can address the illumination issue (I saw several unlit fixtures) soon but definitely everyone needs to get slimmer if they hate literally rubbing elbows with the crowd. However, if there’s one thing that I love about SM Aura, is its parking—even if it reminds me of the other day’s Instagram pics showing the basement parking partly flooded due to sudden downpour—because it has a direct exit to C5. And I know Marcus also benefited from this since after finding no Filbars store in the mall I made a deal with him that we would only drop by Festival Mall to buy el cheapo Ninjago substitutes if we don’t get stuck in traffic. And true enough, C5 gave us a quick getaway and we ended up reaching Alabang in no time. That makes it four malls in one Memorial Day time off. Memorial Day time off. (Clockwise from top left): 1. Marcus’ first mallows on stick of the day–he finished about five among others; 2. Wifey and Marcus; 3. Marcus thrilled that one of the cinemas still shows Iron Man 3–he’s a big fan; 4. Inside SM Aura.